SYP Offshore Sailing Section have chartered 14 yachts, ranging from 35 to 50 foot, from Fairview Sailing since 1999. Based on the River Hamble, with easy access to the Solent, Isle of Wight and North France coast, their fleet consists of over 40 yachts including 20 Beneteau Oceanis 37s launched between 2009 and 2012. They have always provided an excellent service with good quality, modern, clean yachts. In addition to yacht charter, they also provide training from Competent Crew to Yachtmaster Prep as well as yacht handling courses. Website for the SYP Sports & Social club. Includes special deals for members, events and lists numerous other sections. Director, Richard Howell, is a RYA Yachtmaster Examiner and Instructor. Having completed a successful 30-year career as a senior police officer, he combined his management, training, and sailing skills to establish his own Yachting Company and RYA Recognised Training Establishment. Howellsail, based in Wakefield, West Yorkshire, provide shore-based instruction including VHF/SRC Radio Courses, and RYA First Aid. RYA Day Skipper and Coastal/Yachtmaster Theory are also available onshore and online, which is a suitable method of learning for shift workers. This site contains information about Police Sailing throughout the U.K. and provides a central information point for Internet users outside of Force Intranet systems. This means that serving or retired police personnel and their families can now keep up to date with the latest news throughout the U.K. via the Internet. The Police Sport UK comprises the affiliated Sports Clubs of all United Kingdom Police Forces. Its purpose is to promote inter-Force championship events in which members of all Force Sports Associations have opportunities to compete.The organisation is governed by the Police Sport UK Council comprising representatives of all Police regions. All sporting disciplines are controlled by separate National Committees whose members represent the Forces of England, Wales, Scotland and Northern Ireland. This is a vast source of information in relation to all aspects of sailing and windsurfing. Comprehensive Sailing Directions for UK Harbours with free Nautical Charts, this site is an online pilotage guide, which provides timely and detailed information about the various ports and harbours, estuaries, rivers and inlets around the coasts of the UK and Ireland. "an absolute treasure-trove of charts..."
This is a free portable almanac especially designed to be accessed from your touch screen smart phone. If you have an iPhone, or iPod touch or iPad you can even download an app. There are free 7 day tide predictions, forecasts, marina guide and much more. This webiste tracks vessels from their AIS transponder. Follow this link and zoom in to the Solent then hover your cursor over any vessel to see its course and speed. Clicking on the vessel will display pictures and other useful information. There are also apps for Android pones, iPhones etc. Not only is this useful on board but for tracking your friends and families progress while they are away. 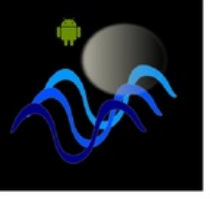 Muchoviento.net have developed a Tidal Prediction app for Android powered mobile devices which has standard port tidal predictions (around 3000 ports worldwide). The designer is quick to point out that it is not for navigation use, but I have dip sampled a number of tidal predictions, compared them with Reeds Almanac, and they are normally within 10 minutes of each other. It is easy to use, and has a graphic tidal curve overlayed with daylight hours and a red line to show the current time. 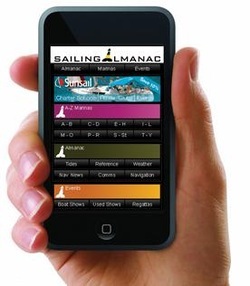 The best things about it is that, unlike the SailingAlmanac above, you don't have to be on-line to use it. Also, its predictions are well in advance of the 7 day predictions offered by SailingAlmanac.com. Search Android Market on your device for 'Tide Prediction'.